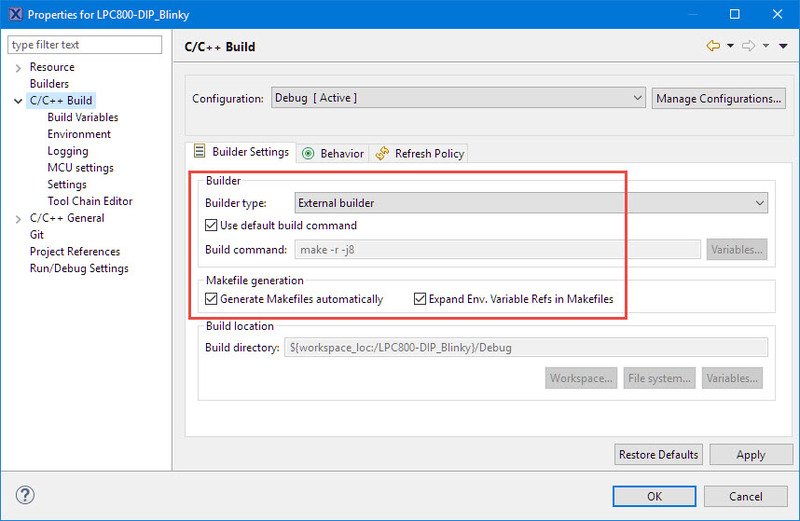 Eclipse comes with a built-in build system (managed make): I can configure the compiler linker settings, and Eclipse takes care about the rest. 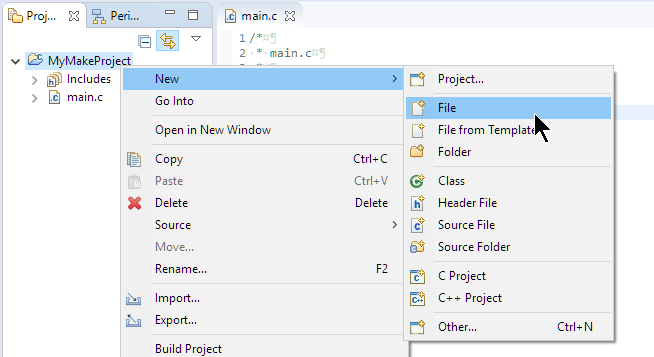 In this tutorial I’ll explain how I can create and use hand crafted make files with Eclipse. 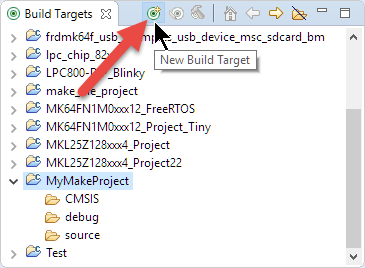 The proposed make file and template makes it easy to control the build system with make. 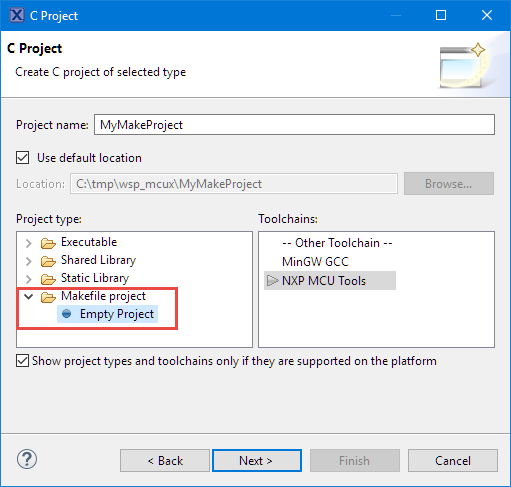 The proposed approach requires that every new source file added to the project requires a extension of the make file, but the make file with auto-generate dependency files for all the included header files. 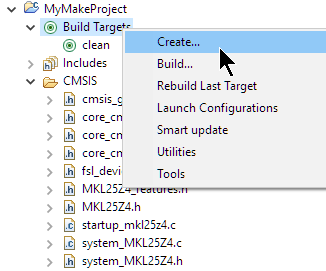 The make file approach requires understanding the build process, and for this it is helpful to understand what is used with the managed make, so I can use it as a base or inspiration. Eclipse IDE. I’m using the NXP MCUXpresso IDE v10.0.2 (Neon based), but any other Eclipse distribution would do it too. Installed GNU toolchain with make utility. Usually this comes with a bundled Eclipse IDE or you can use a DIY toolchain. Compiler and linker settings for your target device. Use the options from an existing example project. Startup and linker files. Here again you can borrow from an existing example project. Application source files. I recommend to start with an ’empty’ main first. A good way to get the necessary files and options is to look at an existing example project which usually is using ‘manged make’. 💡 I have put the sources of this project on GitHub. Check the link to the GitHub project in the Links section at the end of this article. With this, I should have everything to make a make file project. As with many things in Eclipse, there are multiple ways to do things. Then add a main() routine with some code, e.g. This adds an empty make file. The next step heavily depends on the device used. I’m using in this example the NXP FRDM-KL25Z board. To structure things, I have created directories for the sources. 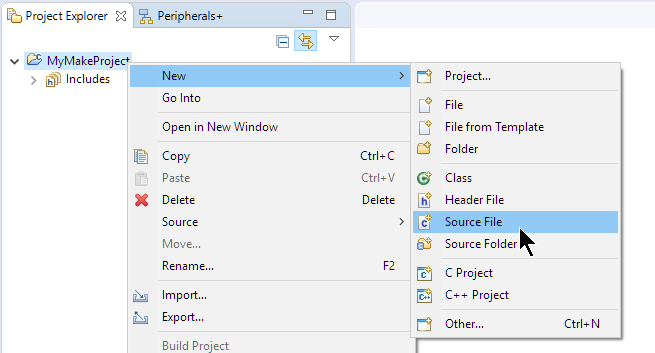 The special ‘debug‘ folder will be used to place the object and executable files. 💡 Note that there needs to be a <TAB> character in front of each command! There are two special targets named all an clean. 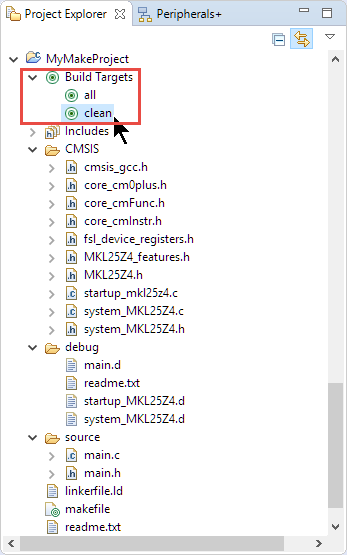 ‘clean’ is used to delete all temporary files, and ‘all’ is used to build the application. CC_OPTIONS := -c -std=gnu99 -O0 -g -ffunction-sections -fdata-sections -fno-builtin -mcpu=cortex-m0plus -mthumb -DCPU_MKL25Z128VLK4 -D__USE_CMSIS -I"CMSIS" -I"source"
@echo "*** finished building ***"
$(CC) $(CC_OPTIONS) -MMD -MP -MF"$(@:%.o=%.d)" -MT"$(@:%.o=%.o)" -MT"$(@:%.o=%.d)" -o "$@" "$<"
💡 The option -MMD -MP -MF”$(@:%.o=%.d)” -MT”$(@:%.o=%.o)” is generating the dependency .d file for each source file compiled. 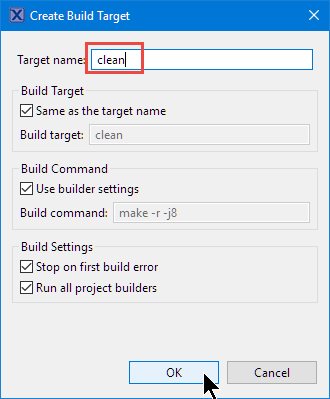 To build the project, the usual ‘make/build’ and ‘clean’ menu/commands in Eclipse can be used. 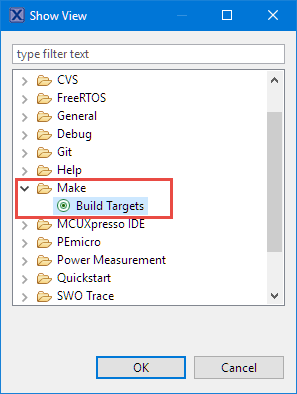 But there is another cool way: Build targets! With this, I can double-click or use the context menu to execute a target in the makefile :-). 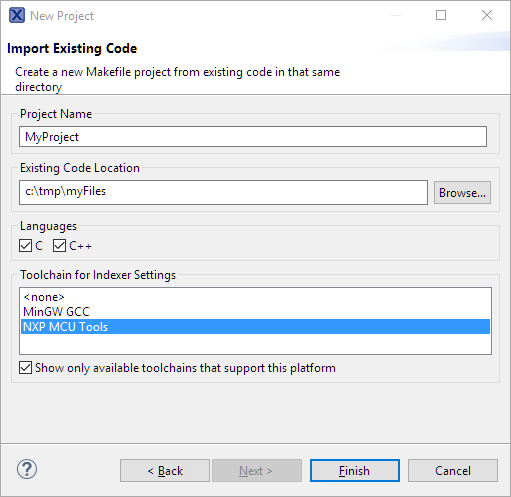 Managed make and build in Eclipse is a great feature: it is simple and easy to use, and probably the right thing for 98% of the use cases with an IDE like Eclipse. But if I want to use normal make files with Eclipse, this is not hard. 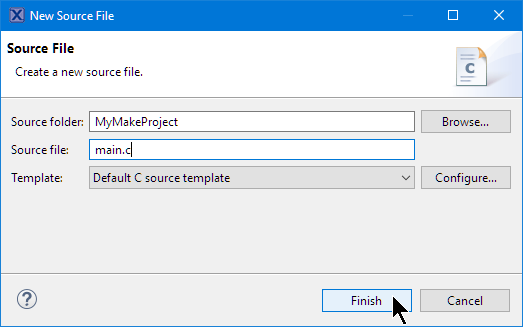 With the proposed make file template I have to extend the list of files if new sources get added to the project. Otherwise everything is taken care of. Writing make files requires a learning phase, but this can be a well invested effort. 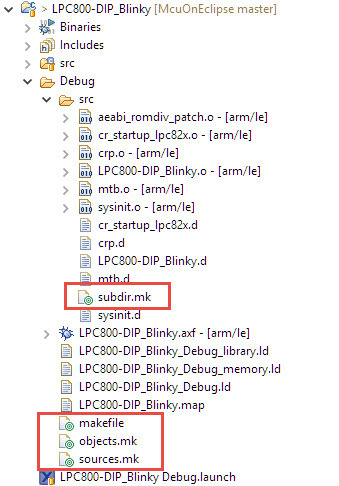 This entry was posted in ARM, Building, Cortex, CPU's, Eclipse, Embedded, gcc, Kinetis, LPC, LPC, MCUXpresso IDE, NXP, Tips & Tricks, Tutorial and tagged ARM, arm gcc, Building, dependcies, Eclipse, freedom board, GNU, gnu gcc, KL25Z Freedom Board, Linker, linker file, make, makefile, NXP, open source projects, software, software project, Startup, technology, Tips&Tricks, tool chains by Erich Styger. Bookmark the permalink. Nice tutorial. I love using makefiles for build automation, I don’t know if its the same in Windows, but I usually do the build based on the project directories, just fetch all .c files in there and .s files and automatically build all of them. make provides some useful features for this sort of thing. You can also specify the source directories directly as variables, and fetch all the files inside those directories with something like C_SRCS := $(foreach dir,$(SRC_DIRS),$(wildcard $(dir)/*.c)) where SRC_DIRS is a list of directories with source files. That way you could even automate populating the SRC_DIRS list based on the project root directory if need be. For the list of object files: C_OBJS := $(patsubst %.c,$(OBJ_FOLDER)%.o,$(notdir $(C_SRCS))) where OBJ_FOLDER is some sort of build directory if you don’t want to make your source folder dirty. Cleaning the project is usually reduced down to deleting that build directory. You can have a look at my makefile here: https://github.com/Muriukidavid/twr-k60n512_2017/blob/master/Makefile . Great input! I have tried OpenSCAD and I love it, but simply had not enough time to deal with it, that’s why I’m still doing my 3D models with Autodesk 123Design :-(. Thanks again for all you do, Erich! 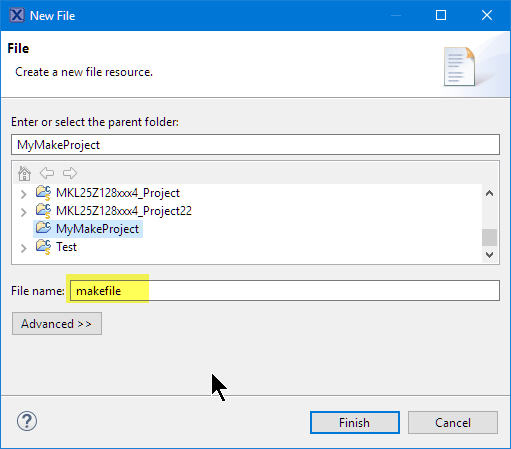 Do you know if it’s possible to have the makefile in another folder than where the project is saved/created and the makefile to use relative paths? So technically, what I would like to achieve is to be able to both do a “make” in the shell and compile the Eclipse project. So far I’ve found out that the Build command (in the Builder Settings) does not manage well the relative paths used by the makefile, and I couldn’t pass this point. I have not used such a structure. But I think you face a problem with the ‘current directory’ if using relative paths. 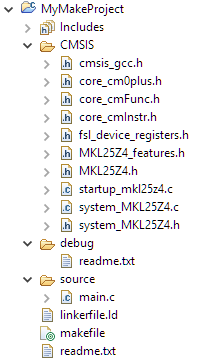 Using Eclipse with the GNU MCU Eclipse plugins, the current directory for the compiler/make/etc is the ‘output’ folder which is usually named ‘Debug’ or ‘Release’, so this is the base for your relative path settings. 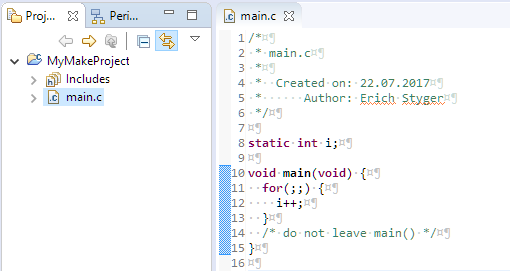 If using make outside of Eclipse, you need to make sure that the current path is the same, otherwise your relative paths won’t point to the correct location? 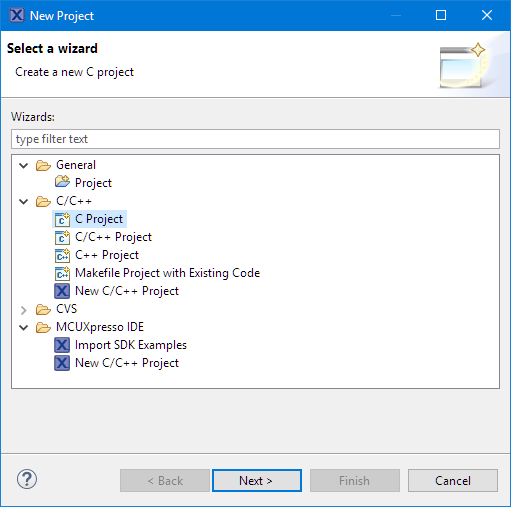 – I want to clone a project from git (or other vcs, or simply unzip a project tree), and -quickly- start working on it from Eclipse, with -all- settings (external build, launchers, indexer settings, etc.) readily available. 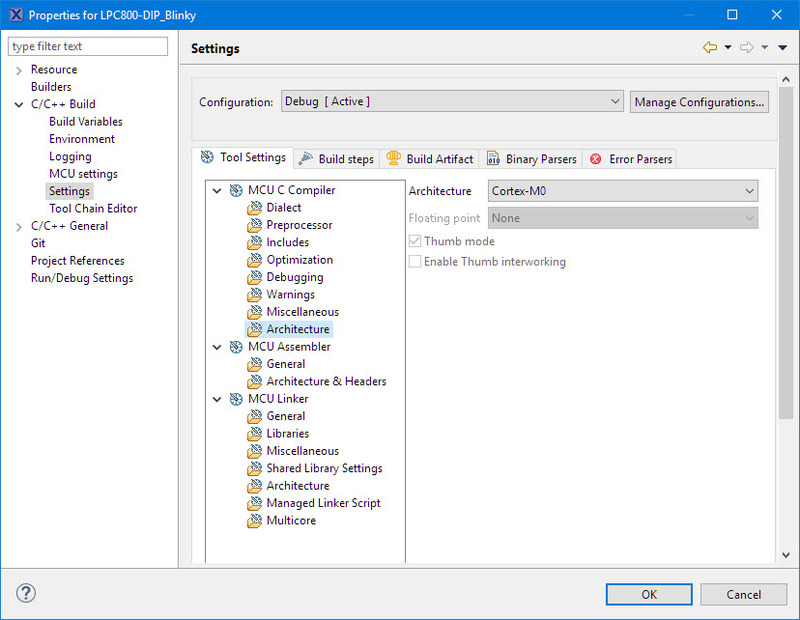 – Similar when cloning the project a second time to a different directory (e.g. working on a different branch in parallel) -> new Eclipse instance to work on that, in different virtual desktop for example. I have never been able to figure this out properly; which files to check in to version control (.project, .cproject, but this doesn’t seem to be enough) to have -all- project settings shared and available. Setting it up once works fine (long list of indexer include paths), but I don’t like doing this multiple times. It’s still not clear to me if Eclipse properly supports this or not. Project settings should (all) be part of the checked-in project in my opinion. Great suggestion, and writing something about this has been on my plate for a longer time. I see how soon I can do this, but right now I’m swamped with getting the new university semester started. 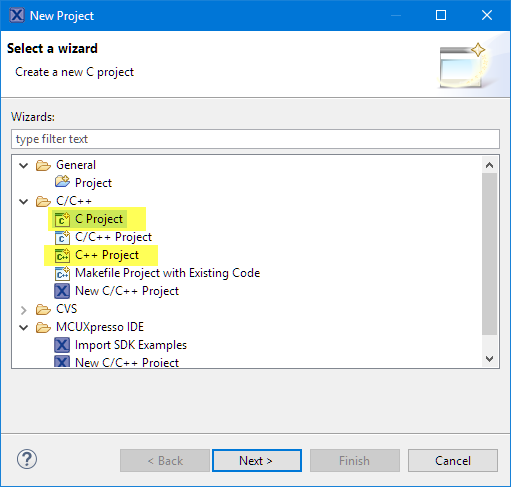 what if i have more than 100 .cpp files in my project? should i add every .cpp to the Makefile and build .o files? if you write your make file by hand: yes.